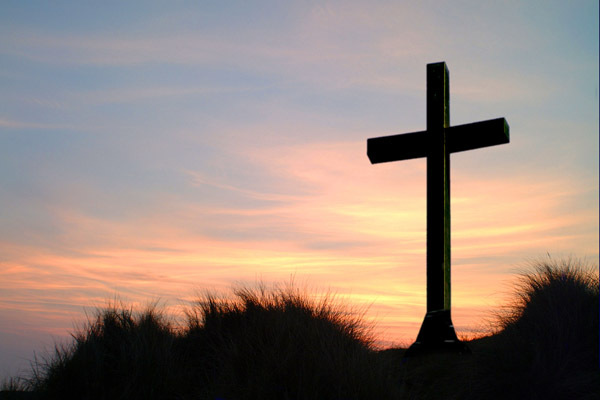 As the Church throughout the world prepares for Holy Week, I offer you a “prayer” that I wrote a few years ago. As anyone who has ever worked in a parish office knows, anything that can go wrong does so in the days leading up to the holiest (and busiest) time of the Church year. From St. Mark’s-in-the-Bowery to Christ Church, Shanghai. Without behaving as if possessed. Always seem to accompany the Paschal Lamb. A mystery worthy of the bishop’s throne. anything to stave off copier repairs. may your copier behave without reproach. May it wait ‘til Low Sunday to breathe its last. Mike Love, the owner of Coffee Labs, shared this with me. Sacrilegious? You could argue. But on the other hand the religious themes in Star Wars practically scream out for this depiction of the Last Supper. Luke, of course, is the Christ figure; Darth Vader is Judas. Beyond that, I’ll leave it to you to determine whether R2D2 is Bartholomew or James. For the sake of comparison, the Da Vinci painting is below. Just don’t ask me to wash Chewbacca’s feet. Made it to a Maundy Thursday service last night. Barely. Lousy directions on the church website but I miraculously got there just in time for the opening acclamation. It was a church I’d never been to — took about 45 minutes to get there (though only 30 minutes to get home). Fine music, good sermon, no foot washing. And I’d forgotten how odd it looks when the three sacred ministers line up in shotgun formation in front of the altar for the eucharistic prayer. Especially when there’s a very tall male deacon and a petite female celebrant. 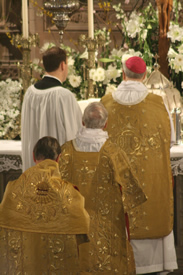 All you could see was the back of the deacon’s dalmatic and head with these small arms sticking out. I did get my foot washing fix in on the way home. Sort of. I found Fordham’s Holy Thursday service on WFDU and I tuned in just as the school’s president was washing the feet of 12 representatives from the congregation. At least that’s what the announcer told the “listening audience.” Looks like I’m stuck with dirty feet this week.